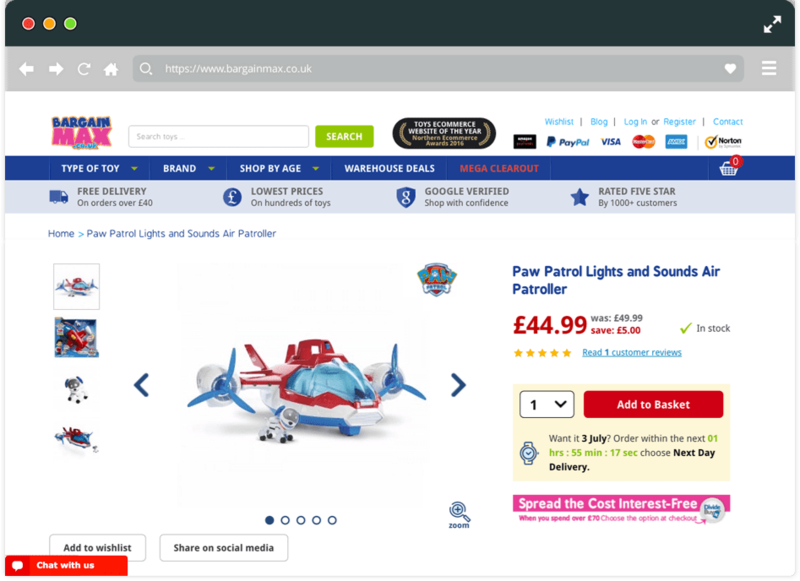 Replatforming an ambitious B2C toy retailer. Plus a bit of PPC magic. Bargain Max is a one stop toy retailer for children of all ages. Their range of cheap toys cover, big names like Disney, Barbie, Lego and Fisher Price. Toys range from baby toys, action toys, doll playsets and kids homeware to outdoor toys. Bargain Max are a retailer with big aspirations and were looking for a partner who could support them in achieving these ambitious business goals. Bargain Max’s existing store was built on a custom Ecommerce platform. This limited the functionality available to them and also created lengthy implementation times whenever new ideas were added to the site. On top of this the front-end of the site was not responsive. Bargain Max also managed their Google Shopping account internally and felt limited by their own capabilities. Add into this the business objective to increase online sales to 40% of all business sales and we not only needed to architect a quality technical solution, but also create a PPC strategy to boost paid traffic numbers while improving their quality and intent. Given the huge 78% traffic source from mobile phones, there was an urgent requirement to make the site responsive and offer shoppers the best user experience, so we prioritised this change to the front-end while the Back-end configuration took place. Magento was integrated with Bargain Max's multi-channel sales platform Linnworks using an API. This allowed Linnworks to: Automatically download new orders from Magento, mark items as dispatched on Magento, automatically adjust inventory. We restructured the Google Shopping account to better cope with the continuous addition of new products and brands, followed by in-depth product feed optimisation to ensure maximum Shopping feed data quality. We then progressed to develop an enhanced remarketing strategy to recapture site visitors.